If you’re in the market for a new lens and don’t know where to start on your quest to upgrade your gear, I would suggest reading Jason Row’s excellent article for advice on choosing which type of lens to buy next, where he addresses issues such as primes vs. zooms, focal length, and lens speed. Once you’ve taken in all that information and reached a final decision in regard to what lens you will be adding to your camera bag, there is still one more factor you may want to account for before forking over your hard-earned money: should you buy an Original Equipment Manufacturer (OEM) or third party lens? OEM, or first party, lenses are those that are made by the same company that manufactures a particular brand of camera. For instance, Canon, Nikon, Pentax, and Sony each make lenses designed to work specifically with their own cameras; lenses from one manufacturer are not compatible with cameras from other manufacturers. Third party lenses (Tamron, Sigma, and Tokina are three of the best known makers) play by slightly different rules of compatibility. An example: Tamron’s 17-50mm 2.8 lens is one of the most popular third party lenses on the market. No matter what brand of camera you own, the Tamron lens is available for each of the major camera manufacturers. It’s simply a matter of building their lenses with different mounts for different cameras. Thus, if you buy a third party lens with a Canon mount, you can’t share it with a Nikon camera. As one would expect, OEM lenses have two premier advantages: Compatibility and quality. Given that modern lenses use electronic mechanisms to communicate with the camera to which they are attached, it makes sense that the camera manufacturer would be intimately knowledgeable about designing a chipset that is perfectly matched to their cameras. The camera and the lens will always be speaking the same “language” to one another. First party lens makers typically take just as much pride in the optics and build quality of their lenses as they do the design of their cameras. Consumers, thus, typically express an elevated degree of confidence in first party lenses. This is not to say, however, that OEM lenses never malfunction, nor are or all the lenses in a camera manufacturer’s lineup created equal. As a Canon shooter I know the infamous 50mm 1.8 (often referred to as the Nifty Fifty) is by all means a capable lens; considering its low price, the biggest knock against it is its marginal build quality. This is simply not a very rugged lens. Nevertheless, it has its place in Canon’s family of lenses, and I am certain that other manufacturers make similar concessions. But, photographers overwhelmingly prefer their lenses to be made by the same people who made their cameras. The most significant advantage of third party lenses is lower prices, while the most glaring disadvantage is quality. But is this always the case? Can third party lens manufacturers ever compete with their first party counterparts in terms of quality? Third party brands don’t advertise on the same scale as the big OEM companies, which is one of the reasons they can offer consumers lower prices for similar lenses. Another reason is related to materials. Generally speaking, third party lenses are designed to maximize affordability as it relates to performance and build quality; as such, these lenses may be housed in less expensive plastic bodies, may lack features such as full-time manual (FTM) or silent focusing (such as Canon’s USM technology), and since they are reverse engineered, third party lenses may present with some compatibility issues. It is not all bad news for third party lenses, though. While third party lenses seem to exhibit more quality control problems, you don’t necessarily have to completely disregard the option of buying from this pool. Just make sure to do your research and understand that you might be searching for a happy medium as opposed to a perfect lens. For example, Tamron’s famed 17-50mm has long been praised for its image quality, yet some photographers have bemoaned the lens’ less-than-stellar build and loud focusing motor. A more recent iteration of this lens apparently features improved build quality and image stabilization, but is claimed by some to not be as sharp as the previous version. Obviously, there are trade-offs you may encounter, but depending on what your priorities are, you may find that certain characteristics of a lens serve as mitigating factors while, for someone else, those same characteristics may prove to be deal-breakers. An additional advantage of third party lenses you may find important is that they sometimes offer lenses that first party manufacturers don’t. One example is Sigma’s excellent 8mm fisheye lens, a lens whose equivalent cannot be found in Nikon’s nor Canon’s lineup. Perhaps this is easier said than done, but don’t make buying your next lens a long, agonizing process; take note of all the features that matter most to you, consult with your wallet, and make the appropriate move. 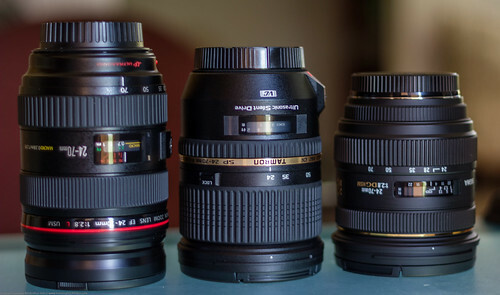 If your budget allows for it, then go ahead and purchase the same brand lens that matches your camera. If you’re looking to save some money, or if the type of lens you want isn’t available from a first party manufacturer, third party may be the way to go; there are indeed some excellent quality third party lenses on the market. But the reality is that you run a higher risk with these lenses. The old adage of “your mileage may vary” is surely befitting this situation. I am fortunate to have had mostly positive experiences with third party lenses; however, knowing what I know, I feel compelled to remind you to do your homework. And a little luck may be in order. So…good luck!